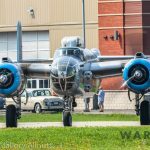 It was sweltering on Monday morning even standing in the shade outside Vintage Wings of Canada’s hangar in Gatineau, Quebec. 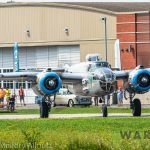 A small crowd of local media members were huddled together alongside the flying collection’s dedicated band of volunteers awaiting the arrival of a special visitor. 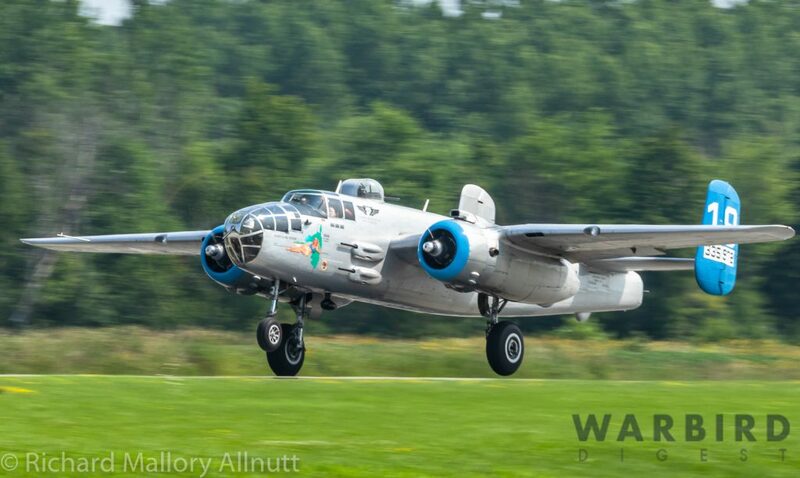 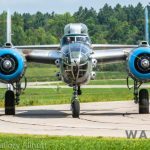 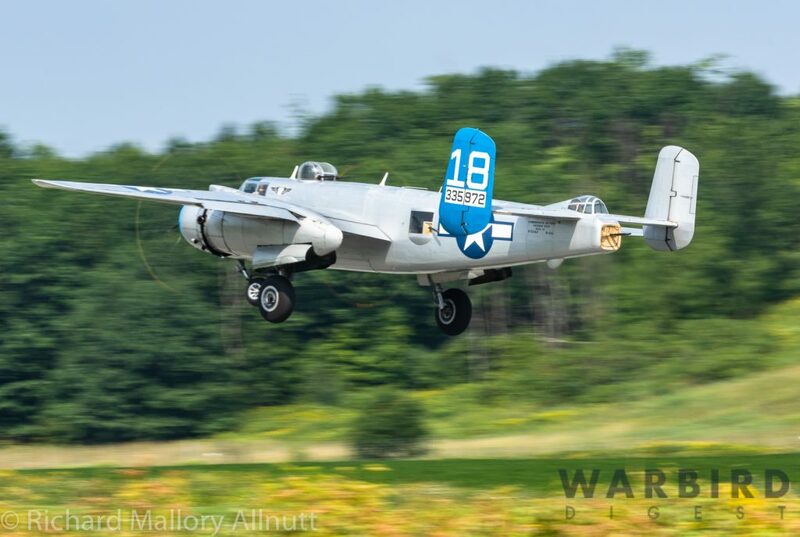 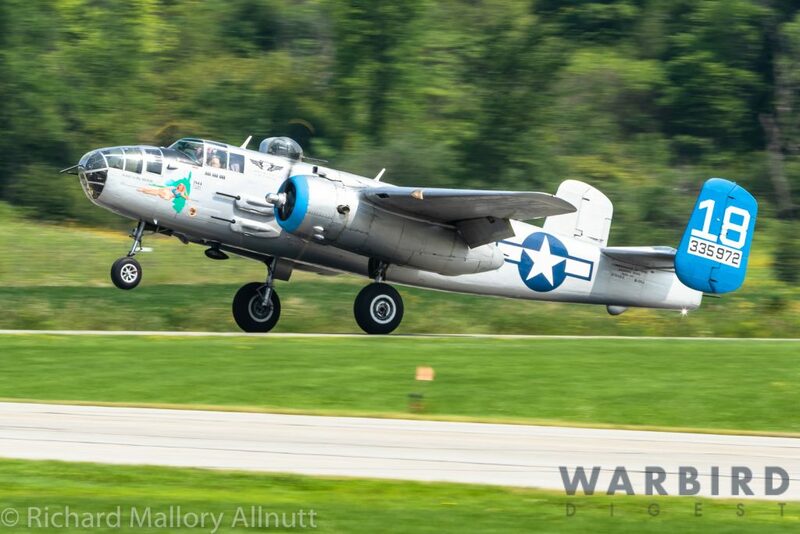 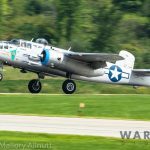 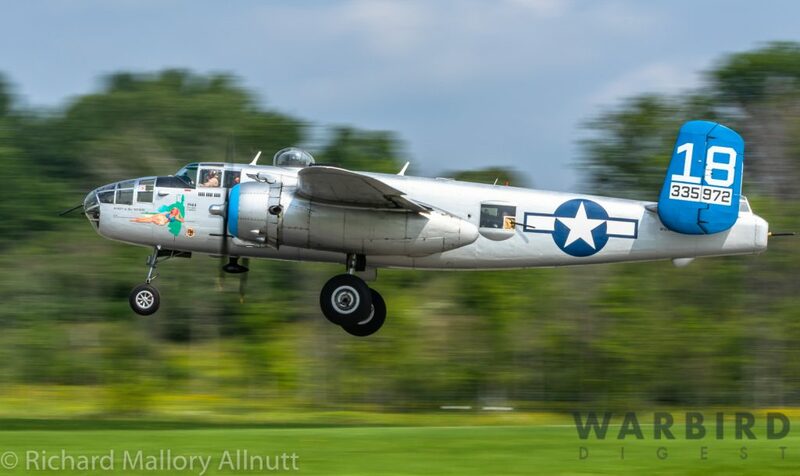 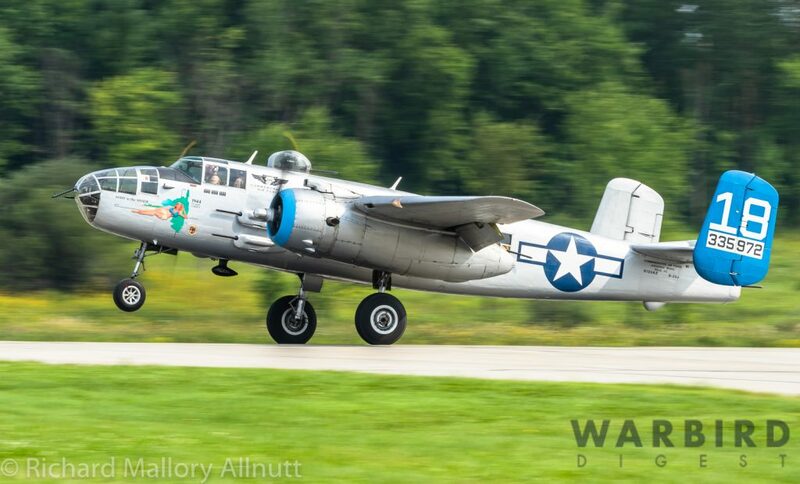 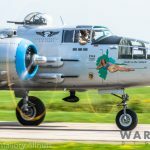 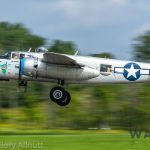 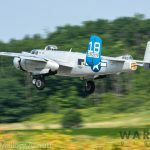 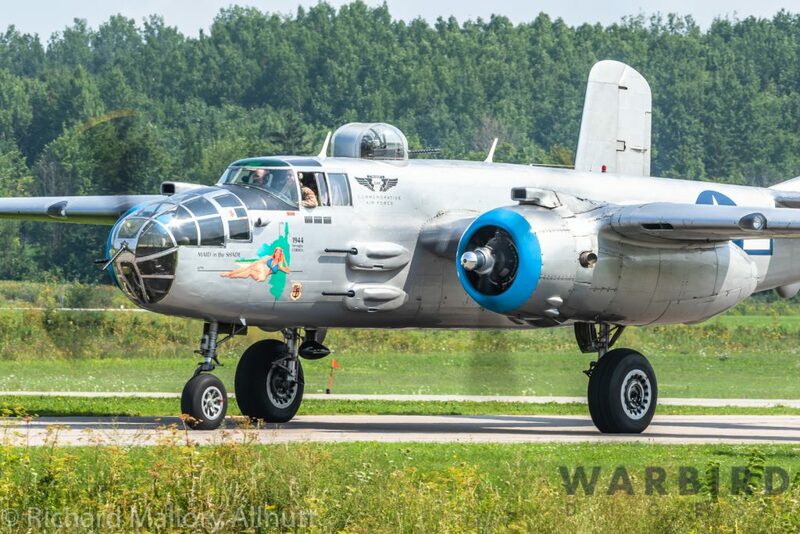 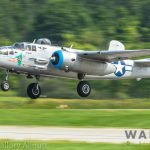 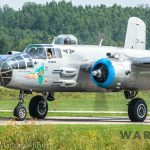 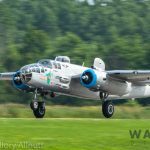 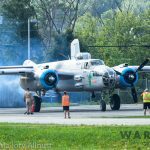 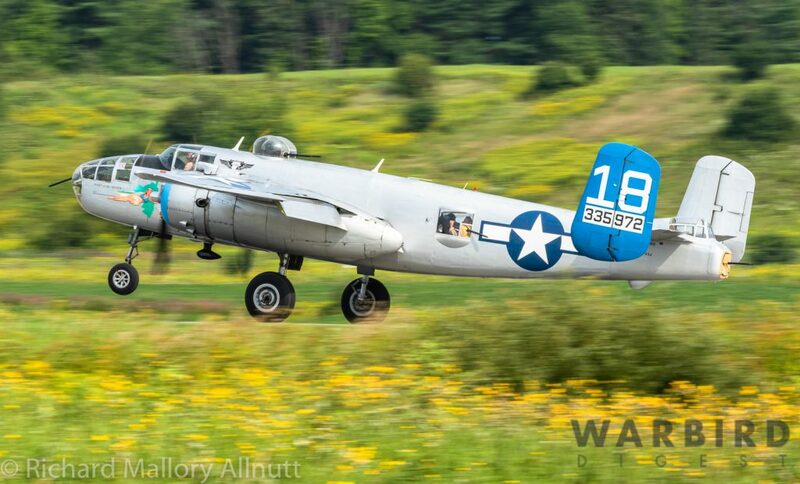 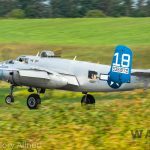 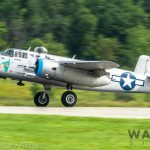 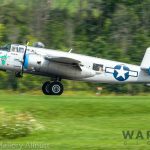 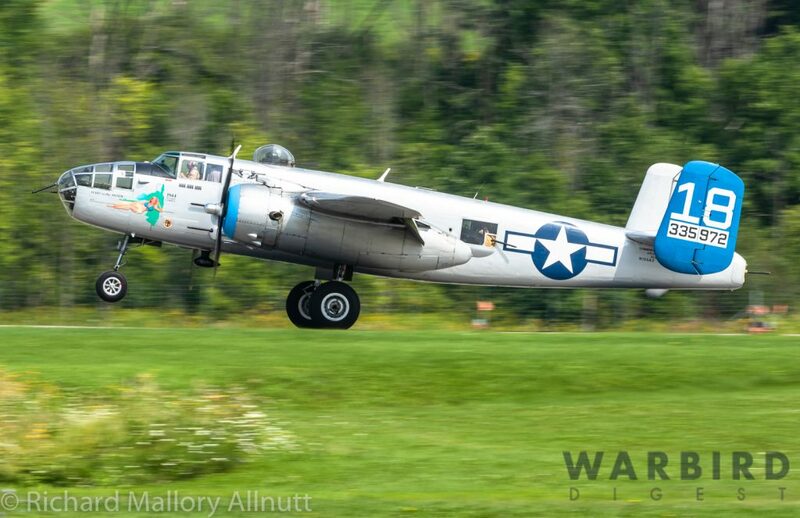 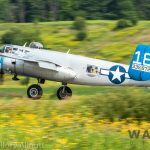 The Commemorative Air Force’s North American B-25J Mitchell Maid in the Shade was due to arrive any moment now, as we carefully made our way out to a small patch of ground near one of the taxi-ways for a closer look with our cameras as the combat veteran bomber arrived. 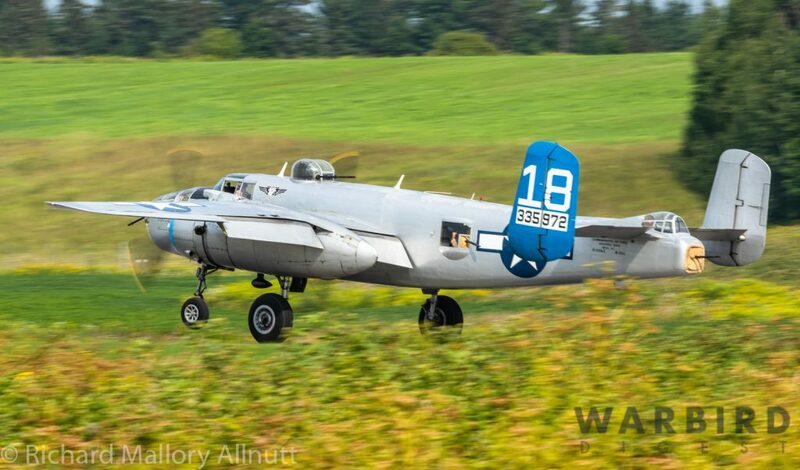 We waited in the baking heat for some time until the familiar thrum of her engines started echoing off the nearby hills. 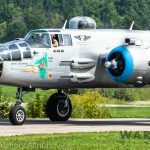 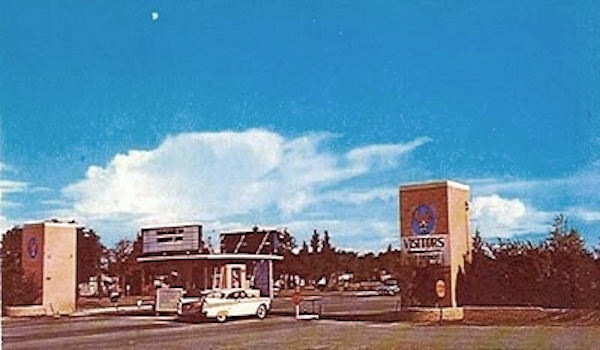 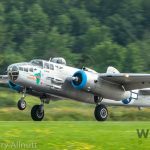 André Laviolette, one of Vintage Wings’ stalwart technicians was the first to spot the bomber on the horizon as she made her way through the soupy haze along the Ottawa River Valley towards the circuit at Gatineau Executive Airport. 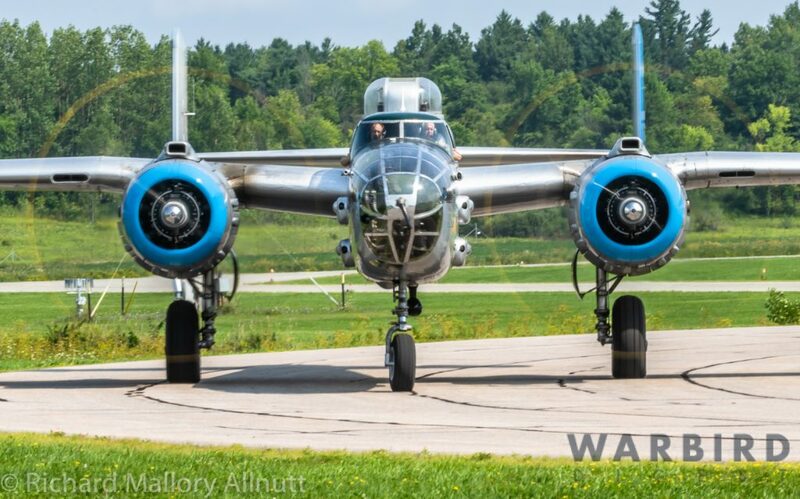 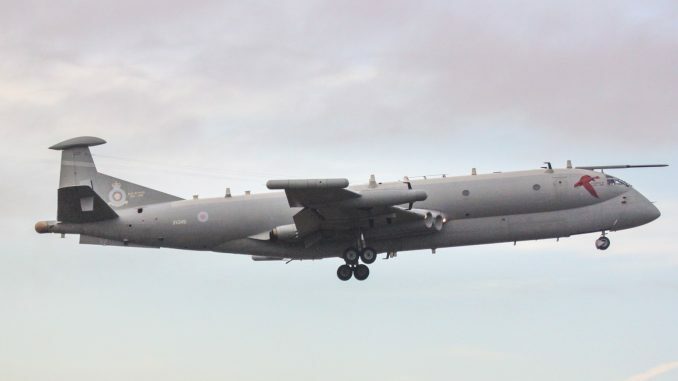 Then down she came, so gracefully, to touch her main wheels on the runway, her pilot holding her nose high during rollout to bleed off speed more efficiently, and reduce brake-wear. 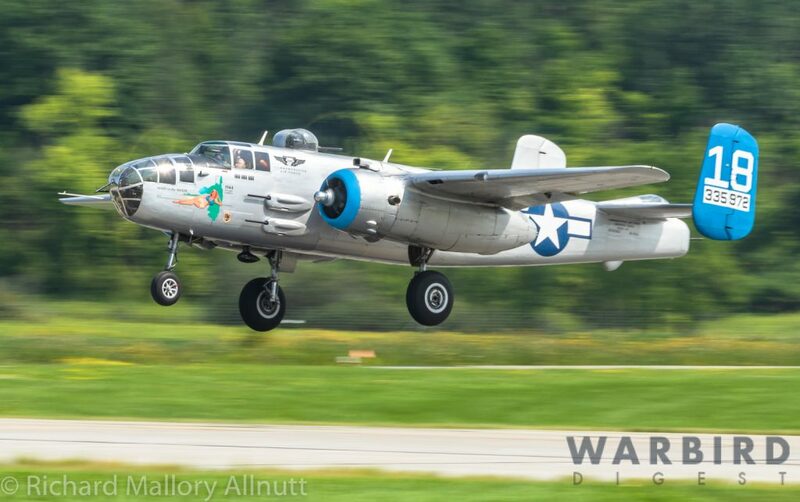 Finally her nose lowered, and she slowed to a stroll before turning onto the taxiway for the journey towards Vintage Wings hangar; the characteristic clatter of the B-25’s unique exhaust stack arrangement creating a kind of music for those of us who love these classic propeller planes. 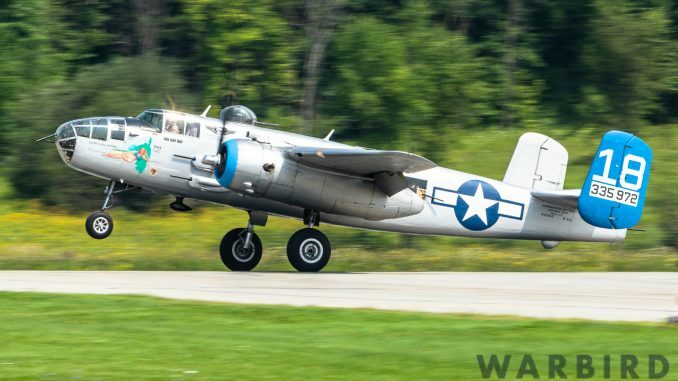 This B-25, serial 43-35972, is one of just a handful of Mitchells which saw combat in WWII which are still capable of flight. 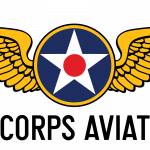 She flew about 15 operational missions with the 319th Bomb Group, 437th Squadron from Serraggia, Corsica between November 1st and December 31st, 1944. 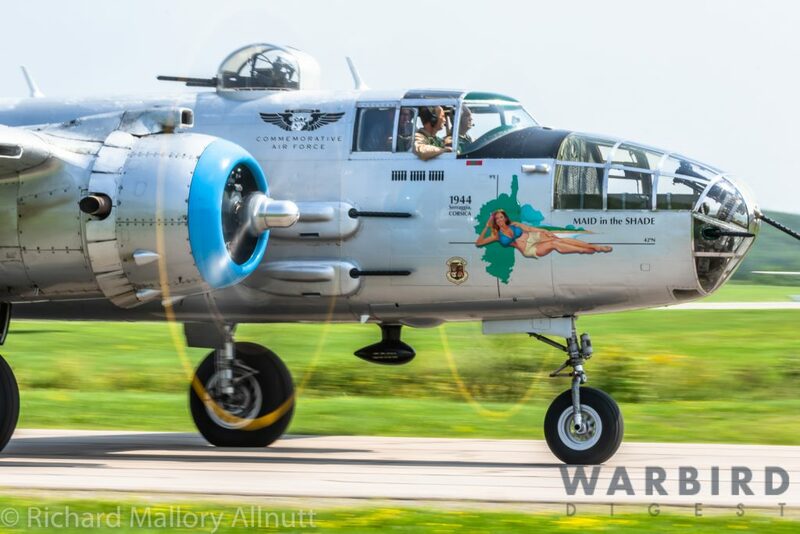 While her name and nose-art are fictitious, she did wear the code “18” during this period. 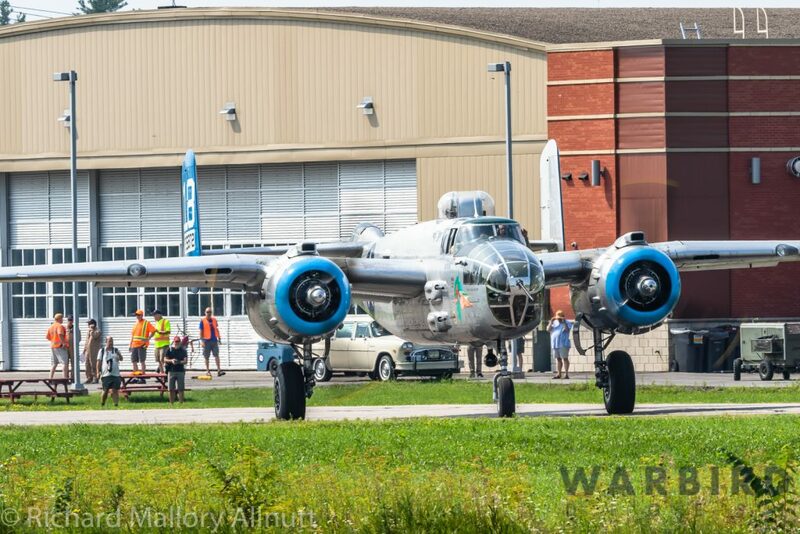 She has been with the CAF since her donation in 1982, after-which she underwent a nearly 30 year, down-t0-the-last-rivet restoration. 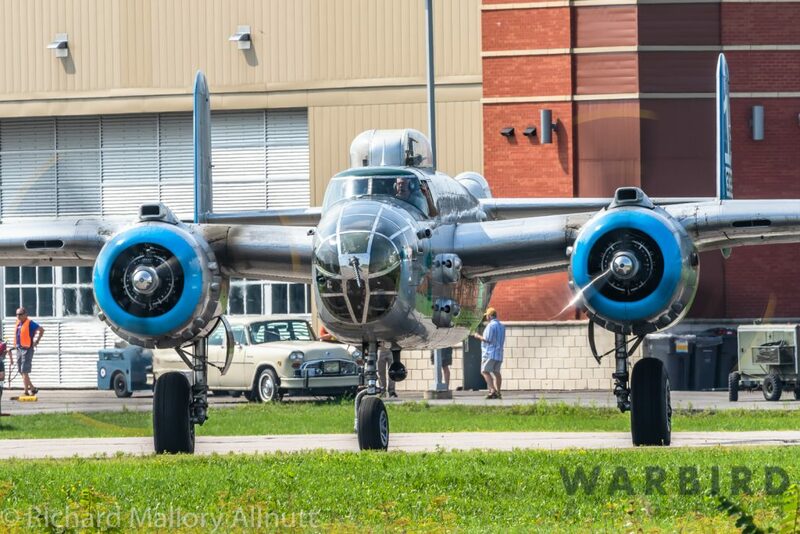 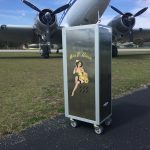 Her current home is with the CAF’s Airbase Arizona in Mesa, Arizona, but she spends much of the year barnstorming around North America giving rides to the public for a small donation. 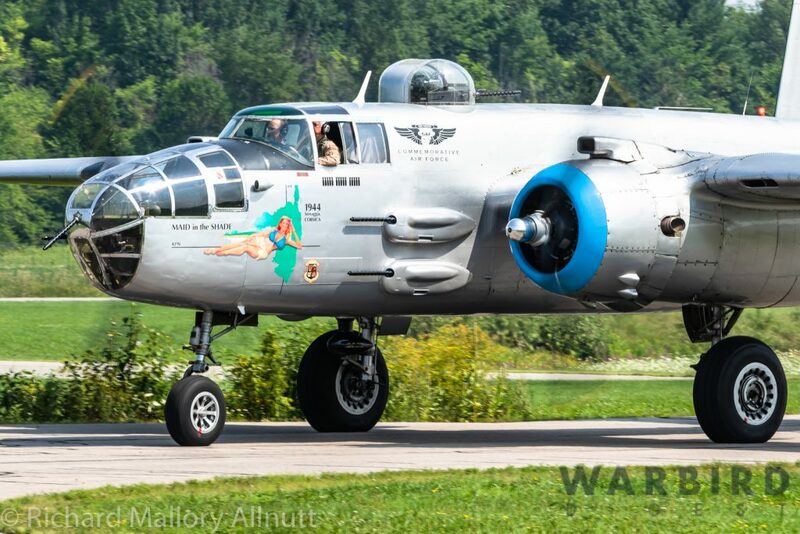 She is currently on the Canadian leg of her tour, and will be in Gatineau until August 12th. 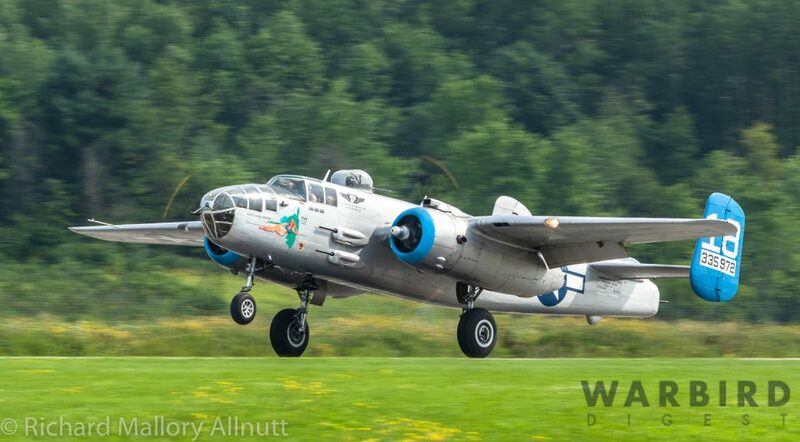 Her next port of call will be St.Hubert, Quebec. 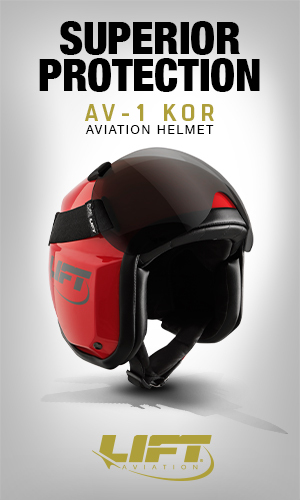 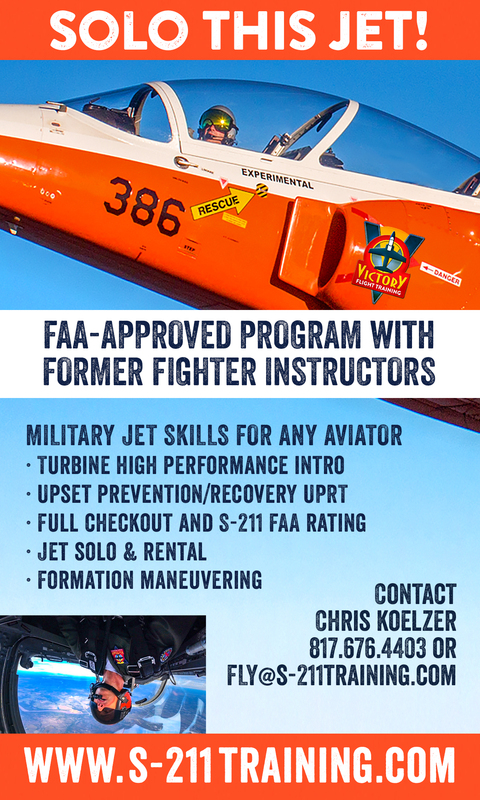 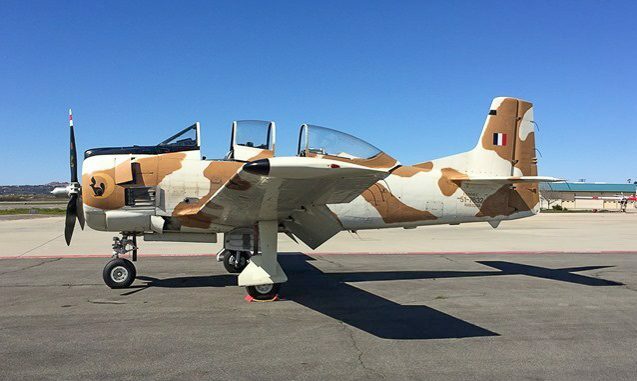 To book a ride aboard this amazing aircraft, please click HERE. 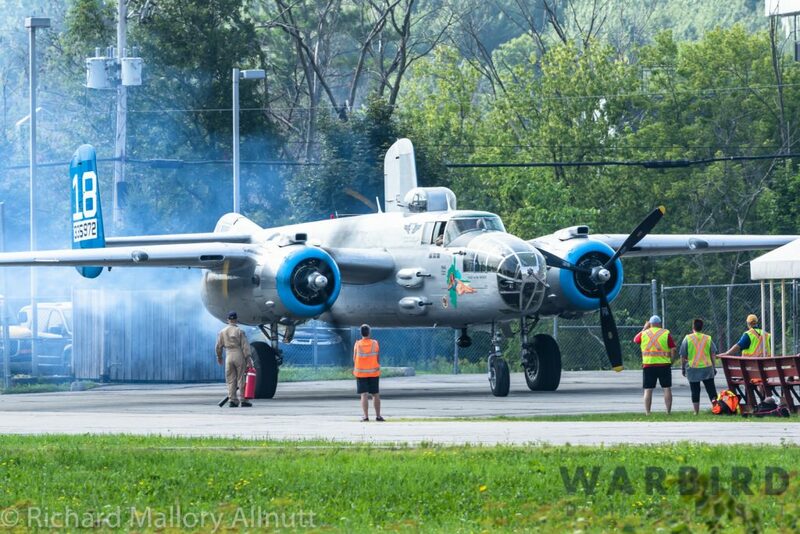 Special thanks go to Vintage Wings of Canada’s André Laviolette for making these images possible. 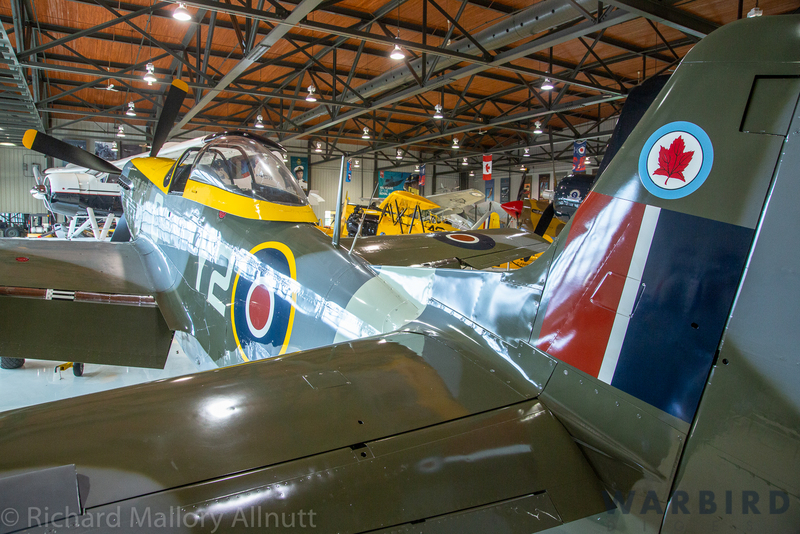 Vintage Wings of Canada’s hangar is open to the public for guided tours on most Saturdays, or by appointment at other times (Click HERE for details). 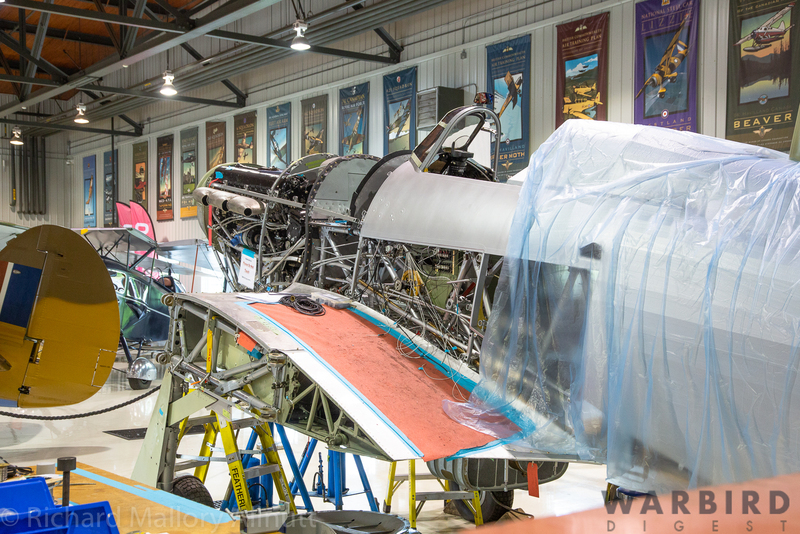 There is always a lot going on in the hangar packed with vintage aircraft, including two major restoration projects – a Hawker Hurricane Mk.XII and her predecessor, a Hawker Fury biplane fighter – already well advanced. 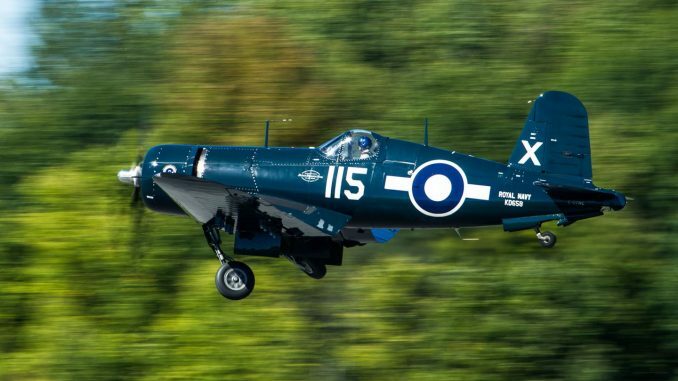 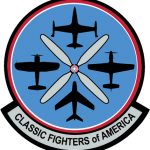 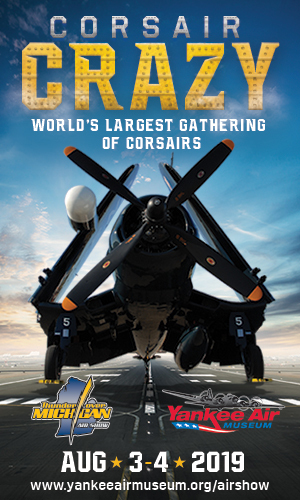 The collection will also be hosting a Fly-In on August 11th, an open house with flying on September 8th, and their always impressive Air Show commemorating the Battle of Britain on September 15th. 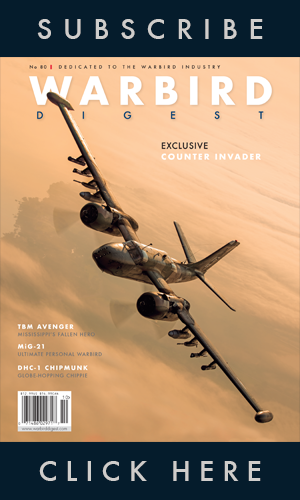 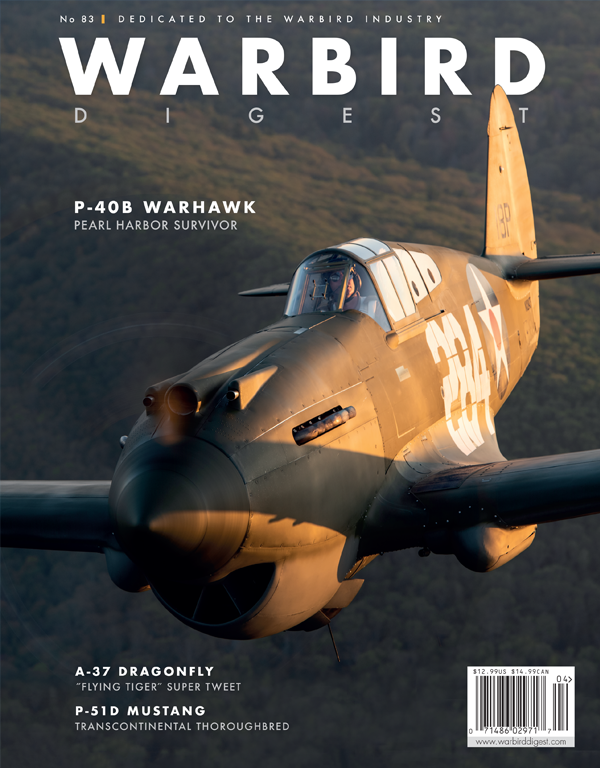 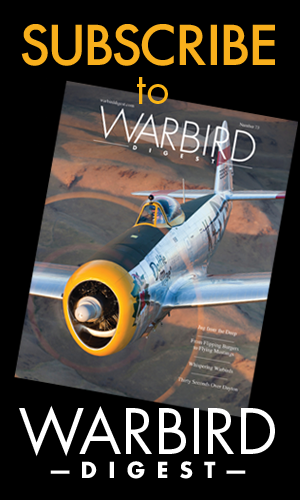 And don’t forget to sign up for Dave O’Malley’s fabulous historical aviation articles which come out on a regular basis either!